 Click the icon table to view the Additional Listing detail page. BenPg Can Inari break above 1.70 on Monday ? oregami why so short-term focus on March Monday? 5G is a very long story. Got 6G or not? Johnfatt both KSP and EPF from net buying to net selling within 3 months, good job! BursaTornado I took profit first. Will buy back after quarterly report. Patrick13 KUALA LUMPUR: Inari Amertron will benefit from the roll-out of the 5G network and infrastructure, UOB Kay Hian Malaysia Research says. It said on Friday that although FY19 will be a transition year for Inari for both its existing and new businesses, the group’s medium-term outlook remains promising, underpinned by 5G. “Besides new 5G smartphones (on multifold increase in RF filters), Inari will also benefit from the inevitable growth in 5G infrastructure with its expertise in fibre-optics chips and optoelectronics. Any share price weakness presents buying opportunity. Maintain Buy. Target price: RM1.80,” it said. UOB Kay Hian Research said while Inari’s utilisation rate for RF testers (42% of group revenue) is only hovering at 60-65%, the group remains committed to its key customer’s capacity expansion plan (testers are consigned by this key customer) which will see additional testing capacity being added by 2019. “We are particularly positive on this as this implies that Inari’s RF customer is expecting a significant uptick in RF demand, likely from the imminent convergence of 5G, which would also directly benefit Inari given its niche-services in this space. Samsung’s latest introduction of the Galaxy S10 (5G) kick-started the 5G wave, and other premium smartphone brands will have to follow suit by introducing 5G phones either by this year or latest by next year, despite 5G telecommunications infrastructure still being at its infancy stages. While 5G phones could have a marginal earnings impact on Inari at the early stages (due to the phones’ high price points), the group’s major customer continuously consigns RF testers to Inari despite the current low utilisation rate of testers at 60-65%. This suggests this major customer could be anticipating a sharp uptick in RF filters requirements once 5G takes off, which will require a multifold increase in RF filters for smartphones. UOB Kay Hian Research said aside from Samsung, the US and Chinese premium smartphone players would be following suit and this would also lend strength to Inari’s RF demand. Besides a multiple-fold increase in RF filters expected in the new 5G smartphones, Inari will also benefit from the inevitable growth in 5G infrastructure with its expertise in fibre-optics chips and optoelectronics. The research house said time was needed for its new business with a German customer. “For its existing operation, Inari’s new products ramp-up for this customer, that is, 2D and 3D FR sensors, health sensors, and mini LEDs are still on modest volume. “With the recent takeover talks by private equity firms alongside lower earnings forecast mentioned in an ad-hoc statement by this customer, we also do not discount the potential slowdown in the new business development between Inari and this customer. “Note that Inari now expects to obtain the new P34 plant’s (680,000sf) certificate of completion and compliance (CCC) in June 2019 (instead of expediting by April 2019), with the exact timing for the commencement of production still in discussion at the moment. “All said, we believe Inari is the frontrunner to benefit from the outsourcing model by this customer should the latter adopt such modus operandi to boost its margins,” UOB Kay Hian Research said. Patrick13 Despite a tepid year ahead due to lower sales for the radio frequency segment (RF) amid weak smartphone shipment at key end-customers, AllianceDBS Research has upgraded Inari Amertron Bhd to a “Buy” with a higher target price of RM2, from RM1.60 previously, as it views ample upside opportunities moving forward, especially from the introduction of 5G technology. In a note today, the research firm said while the stock has corrected by 35% from its 2018 peak and its share price might still be dampened by near-term quarterly earnings weakness, this could provide the opportunity for investors to accumulate. 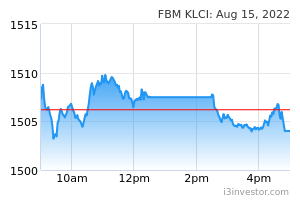 It added that the recovery in the radio frequency (RF) segment — tracking Broadcom’s guidance — and Inari securing new businesses for its new P34 plant in Batu Kawan, should also progressively take place towards end of second half of this year. “Looking beyond the current transition phase, we believe investors will start to appreciate the 5G growth potential for Inari, once the technology is progressively being ramped up in new smartphone models. “In our forecasts, we expect Inari’s radio frequency segment to grow by 15%-17% from financial years 2020 to 2021 (FY20-21), recovering from the dip in FY19. This is also partly helped by the expectations that Broadcom would regain the market share that it lost to competitors. “This should also help to boost Inari’s valuation, which is currently trading at its mean of about 17.5 times calendar year 2020 price-earnings ratio (PER),” its analyst Toh Woo Kim wrote, adding that the higher-than-consensus PER is as he believes its valuation will re-rate, once Inari’s RF segment returns to growth trajectory. Shares of Inari were traded unchanged at RM1.64 as of writing, for a market capitalisation of RM5.21 billion. DawnRaider Wow big push today! Up at 1.76 highest. What’s going on? nckcm Wa wa wa epf to the rescue ! sinyc My friends already received the notice of conversion for the Inari-WB warrants and have executed. I have not received mine. How do I go about it? I traded using CIMB Itrade. Sorry for noob question. yorkyork Friday news, trump want American company pick up 5g and lauch it in year end. ramada Gain 11 sen. Very good. RPH02 Tomorrow drop 1.67 me want buy little big..... Just Want 1cups coffee.